If anything can bring you comfort after a chaotic week, it's a small bag of Flamin' Hot Cheetos and a tall, cold Bloody Mary at Saturday brunch. 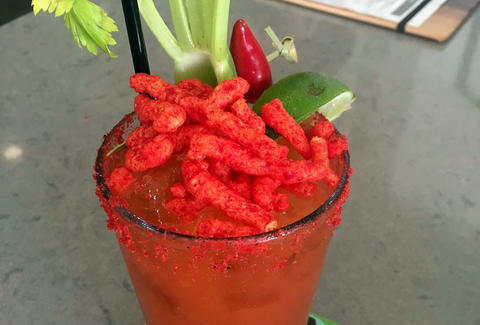 One intrepid bar in Irvine, California has chosen to combine those two vices into a crunchy cocktail currently taking Instagram by storm: the Flamin' Hot Cheetos Bloody Mary. The idea is simple enough: marry the inherent spiciness of a Tabasco-fueled bloody mary with the sinus-cleansing potency of Flamin' Hot Cheetos. Given that Flamin' Hot tequila shots are already a thing, it's hardly surprising that forward-thinking bartenders like those at Irvine's Center Hub Bar would infuse their more complicated cocktails with the iconic snack. Just look at it. It's a standard Bloody Mary, of course -- vodka, tomato juice, hot sauce, Worcestershire sauce, pepper, a stalk of celery, and lime -- but topped with Flamin' Hot Cheetos and rimmed with the Cheeto dust, it somehow becomes something more, like a red glass of alcoholic rocket fuel you can sip straight to your brain. The comments on it are nothing but praiseworthy so far, flooding the tough streets of Yelp and Instagram with OMGs, LOLs, "we need these," and "Just Tell Me When Bruh!" For the foreseeable future, they're available at Center Hub, located in Irvine's Trade Food Hall. As Refinery29 points out, the best way to enjoy these seems to be to start with the Cheetos and work one's way down. You wouldn't want them to get too soggy before you've had a chance to savor each element of this layered concoction.